Theme from the BBC TV series The Vicar of Dibley. Composed by Howard Goodall. Choral (Sacred); Choral Octavo; Performance Music Ensemble; Single Titles; Worship Resources. Faber Edition: Choral Signature Series. Sacred. Choral Octavo. Faber Music #12-0571520480. Published by Faber Music (AP.12-0571520480). ISBN 0571520480. English. Psalm 23. 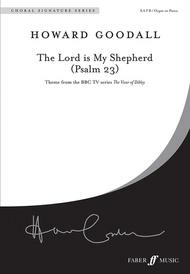 The Lord Is My Shepherd is best known as the theme tune to the award-winning BBC TV series The Vicar of Dibley. Goodall's setting of Psalm 23 is warm and melodious and has been, and will continue to be, popular with choirs everywhere. Alternative accompaniments for strings are also available. the music. It is simple but challenging; a good note reading challenge. Our organist and accompanist was impressed as well. He thought it was the best piece of music we have bought for a long time. A heavenly sound ! While the melody of this anthem is beautiful, I find the parts to be not terribly well-written. My better-than-average choir is not enjoying it as well as we hoped.